Here's three great pieces of Star Wars inspired Geek art from artist Frank Stockton. These were done a couple of years ago, but I haven't posted the first two pieces before, so here you go! Between ESB and ROTJ, Luke withdrew to his former Master Obi-Wan's hut in Tattoine to complete his Jedi training in solitude. For this piece, I chose to illustrate the moment of him completing the construction of the light saber he would eventually use to defeat Darth Vader and rescue his father with. While listening to the Star Wars Radio Dramas, I was struck by what is perhaps the most intense scene in A New Hope; Darth Vader's interrogation of Princess Leia Organa. The scene, which explicitely conveys the sick and twisted evil that had overtaken Anakin by that point, foreshadows some of the pivotal events that would leave us aghast in forthcoming episodes. 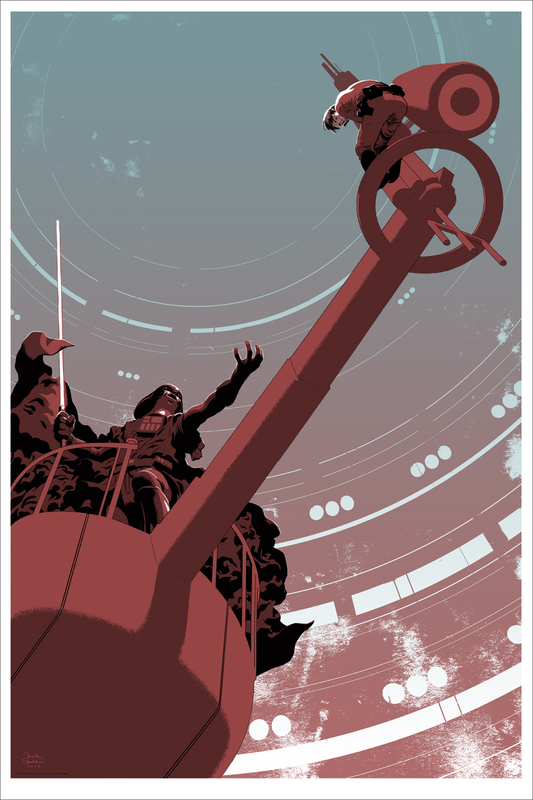 This poster is called Luke's Destiny and was made for Mondo's Star Wars poster series.